Current information relating to land rights, agriculture, and forestry in Cameroon is now easily accessed with the development of the Cameroon Interactive Forest Atlas, produced by Blue Raster in collaboration with the World Resources Institute. The Atlas combines the use of remote sensing, mapping, and ground-truthing to monitor and manage forests. Stakeholders can access timely and accurate information about land use allocation within the national forest estate (forest concessions, protected areas, council forests, community forests, etc.) through the Forest Atlas. The goal of the project is to place forest information securely into public hands to support transparent and participatory decision making towards sustainable forest management in Cameroon. For Cameroon, WRI aimed to play a role in supporting environmental protection and promote responsible population development, economic growth, and use of local resources by providing a clearer picture when discussing local environmental issues and greater socio-economic issues for the nation. In supporting that goal, Blue Raster was charged with creating a multilingual user-friendly application for accessing this detailed information on the local forestry infrastructure. 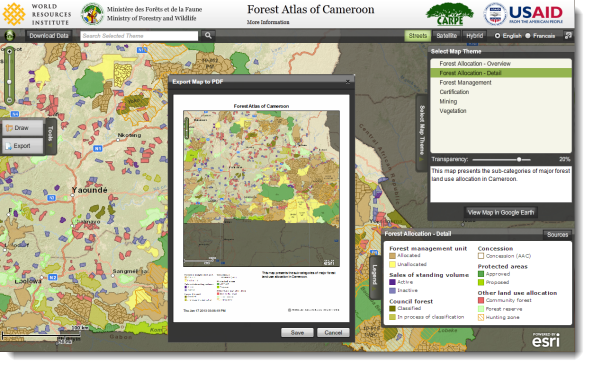 Using GIS data, the Cameroon Interactive Forest Atlas displays information on concessions and boundaries, better explains the legality of logging in specific regions, and reveals areas of responsible mining and agriculture. For analysis, the data can be overlaid on satellite imagery giving the user both a current and clear visualization of the area. “The Forest Atlases are an essential contribution towards improving the management and monitoring of forest lands across the Congo Basin. Through the online and offline Atlas applications, users can easily access up-to-date forest information without any technical training – significantly lowering barriers for turning information into action”, comments Matthew Steil, Manager, People and Ecosystems at World Resources Institute. With support from USAID, WRI promotes responsible economic growth alongside environmental protection in developing regions. 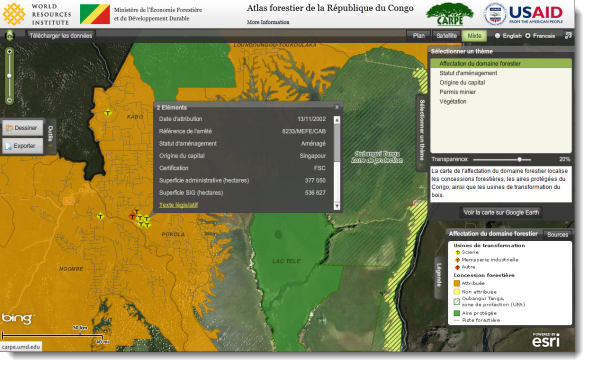 Through continued collaboration between WRI and Cameroon Ministry of Forests and Fauna, Blue Raster will continue to contribute to this project by updating it regularly, giving users access to the most current and accurate information available to promote the objectives of WRI in the Congo Basin.